Like the rest of the world, I’ve been grieving for the loss of life in Newtown. Like the rest of the world, I’m sad, angry and frustrated beyond words. I have shed tears for the sweet children and heroic adults who were exterminated in a brief barrage of a semi-automatic weapon: a weapon that should never, ever be available to any citizen. Seven year-old children and the teachers who nurtured them were obliterated. It doesn’t seem possible, this horrifying nightmare. It happened in Newtown. It could have happened anywhere. The untold anguish of the parents, families and members of the Newtown community is impossible for me to fully know. If my sorrow is so deep, how excruciating is their pain? What gives them the courage to go on? I think about them and their lives which have been irrevocably and horribly savaged. And what about children everywhere, even beyond Newtown, whose innocence is shattered and whose fears may not easily be quelled? Glued to CNN, I am flabbergasted by the facts and statistics I have learned. There are more registered gun dealers than McDonald’s restaurants. After the Aurora shootings, gun sales in Colorado spiked over 40%. Americans tried to buy 200 millions guns just in November. Three deaths every hour occur from gun violence. It is easier to buy a gun than it is to vote, drink a beer or buy a cell-phone contract. I mourned the tragedies at Columbine, Aurora, Virginia Tech, and others. I bemoaned our violent society, worried about copycat shootings in the aftermath, shared outrage with my family and friends. In the end, however, we resigned ourselves to the fact that nothing would change. The NRA was way too powerful and politicians were way too meek. Like most of the rest of the world, I did little outside of talking about it. Yes, I hugged my children tighter. That made me feel better, but did nothing to address the larger issue of gun violence, which is something that affects us all. This time, things are different. Some are saying that the massacre at Sandy Hook Elementary School has turned the tide of public opinion. I vow that it has awakened something in me. No longer will I passively sit by and accept this impenetrable culture of gun worship. I no longer feel impotent and unnoticed. With public outrage at its zenith, with strength in numbers, now is the time to make our voices heard. My fellow blogger, Sharon Hodor Greenthal, has provided ways you can help in this post. I am making phone calls and writing letters to my legislators and imploring them to support new legislation on gun control. I will add my voice to the growing chorus of mothers, fathers and families who will not stand for this anymore. When evil shadows good, it is our responsibility to make our world right again. It must happen now. Will you please join me? A Broken Heart – The Kids are Grown, Now What? 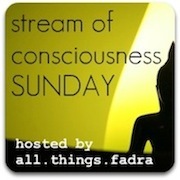 I am hanging out with all.things.fadra today on Stream of Consciousness Sunday. What does that mean? In a nutshell, the Archdiocese of Philadelphia announced the closing of four high schools and closing and/or merging 45 elementary schools when the school year ends this June. Citing drastically shrinking enrolments and escalating costs, the archdiocese said that this decision could save as much as $10 million a year. The announcement has caused palpable waves of despair. The news coverage has been huge. Pages in the print and digital media have covered the impact on students, families, teachers, neighborhood. Not to mention proud alumni of these schools. The Inquirer quoted teachers as lamenting “this is like a death.” Students of all ages have been photographed hugging and weeping. Parents are shell-shocked. You can just read their minds. How can this be happening? I am not Catholic and was a public school kid myself. But it is not hard to understand the impact on families with the loss of these schools which, along with the parish church, served as the backbone of many neighborhoods. Anyone can relate to the helplessness of not being in charge of your own destiny. You have an expectation that your life will play out as planned, give or take some detours along the way. Education is one of those things that seems pretty well-scripted. It can be what you want, pretty much. Eventually the dust will settle, the shock will settle into resignation. Students will be rerouted to other schools and make new friends. Life will go on. But the conviction that some things are forever will be shaken to its core.